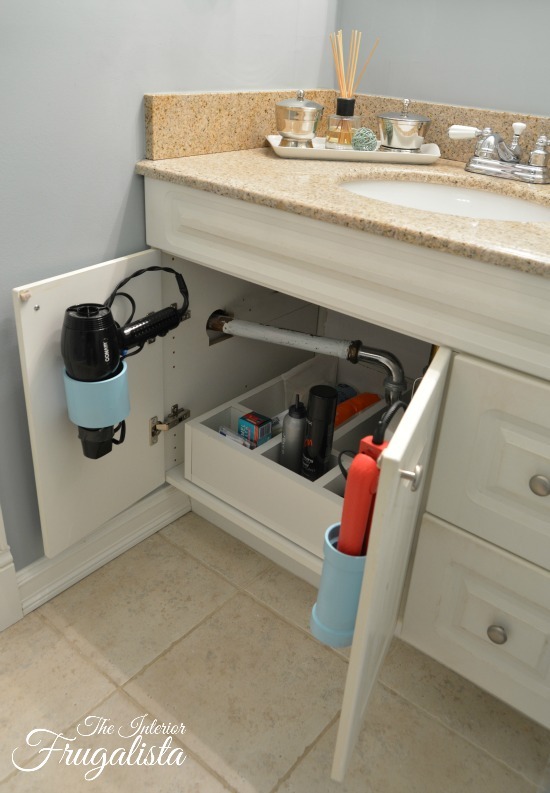 Are you tired of the struggle to find things under the bathroom sink? This old gal has crawled on her hands and knees far too often looking for toiletries way at the back. So I finally did something about it and built a bathroom vanity sliding shelf. I don't know what took me so long because it wasn't difficult to make and I'm going to show you how. 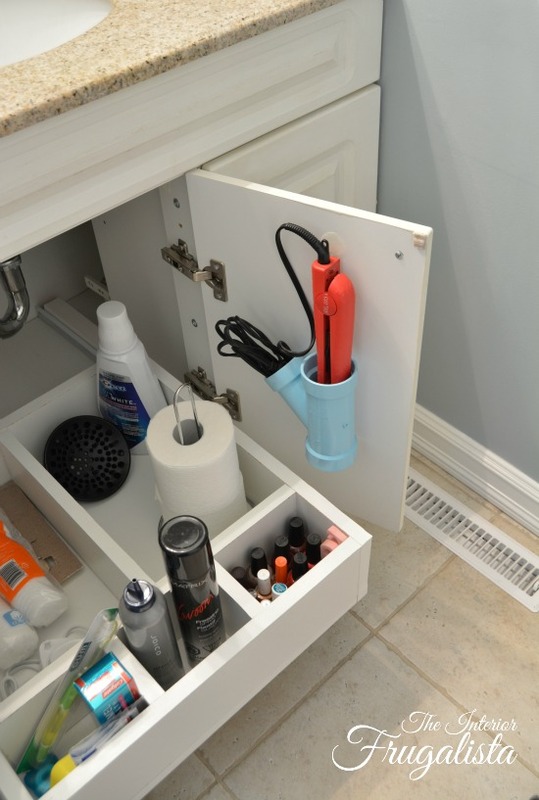 It took this month's Power Tool Challenge to give me the motivation to build this handy bathroom organizer. The theme this month is home improvement and considering we replaced the original vanities in our 1960's home a few years ago, it was about time I got them organized. 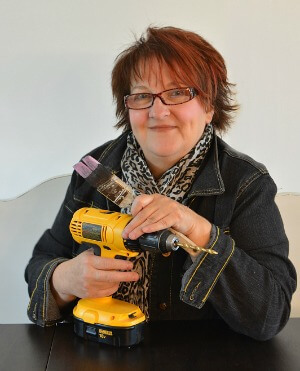 If you haven't heard of the Power Tool Challenge, it's a group of talented tool savvy, skill sharing female DIY bloggers who come together each month to empower our female readers to step out of their comfort zones and try simple projects they can make themselves using power tools. 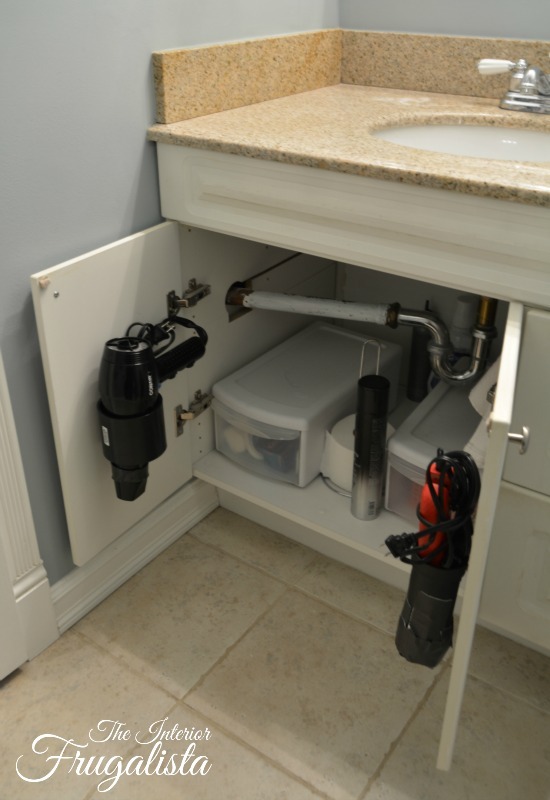 You can see in the photo below, now everything is organized and accessible with just one pull. Even my Friar Friar Pants On Fire OPI nail polish has a home. Pictured below was my feeble attempt at keeping the vanity organized. Using a dollar store paper towel holder for storing extra rolls of TP is very handy. PVC Pipe on the doors to house my blow dryer and flat iron is awesome too. But those stackable plastic drawers were not functional at all. First, they didn't hold very much. Second, there wasn't enough clearance under the pipes to stack. And third, because they were not as deep as the vanity, they slid around every time I opened a drawer. I prettied up the PVC holders by spray painting them in the color Aqua by Rust-oleum Satin Ultra Cover Finish. 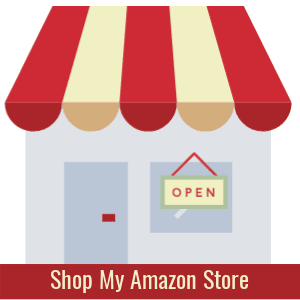 I've included affiliate links in this post so you can see what tools and products I used to make this project. See my disclosure policy. 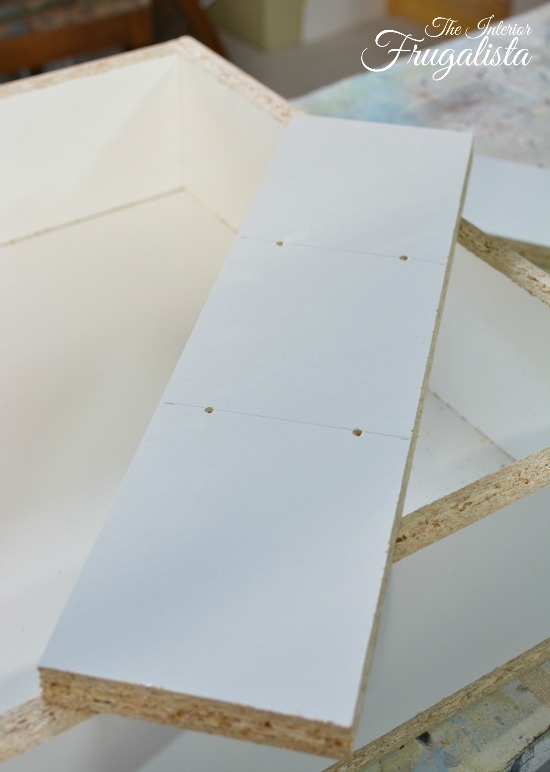 Use a table saw to cut a sheet of white melamine particle board into the pieces needed to make the shelf. 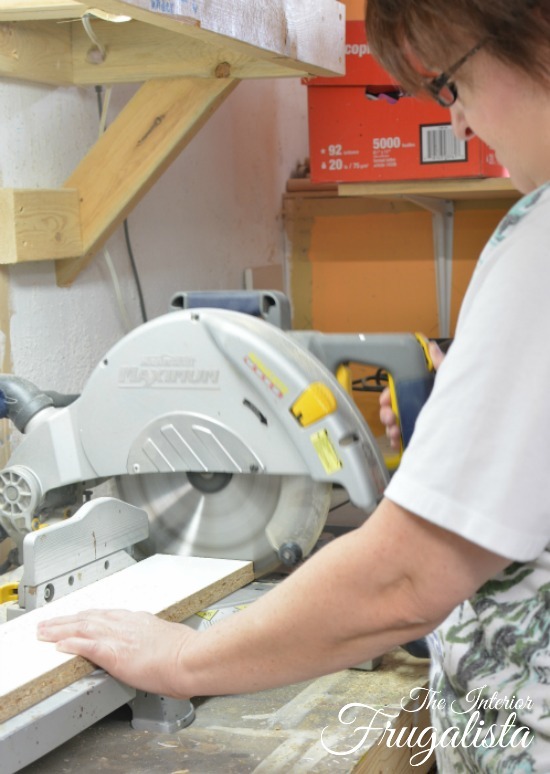 If you don't have a table saw you may be able to get your local home improvement store to cut the melamine for you. Based on a 36-inch bathroom vanity with an inside width of 22 1/2-inches. Base: 20 1/4" x 19 1/4"
Sides - 6 pieces: 4/12" x 24"
Using a miter saw, cut the front and back pieces 17 3/4-inches long. Cut two more 20-inches long for the side rails. NOTE: Keep the off cuts as they will be used to make cubby dividers later. 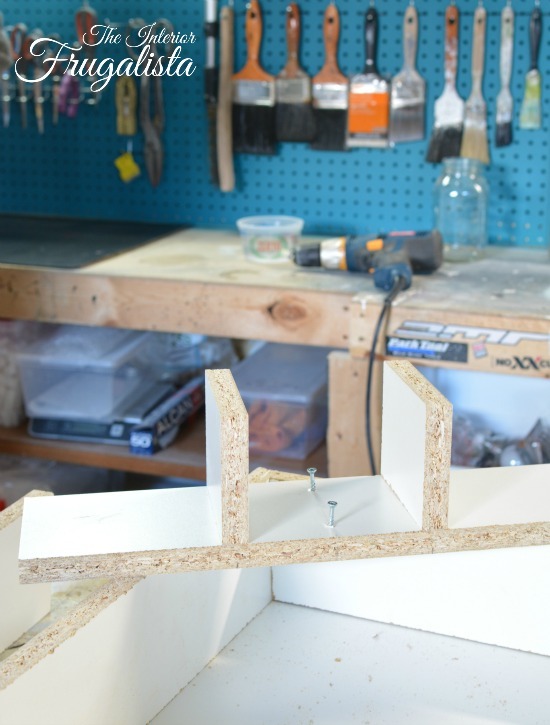 Use a corner clamp to hold the shelf and one side piece together and flip them upside down. Drill pilot holes for the screws with a 1/16-inch pilot hole bit on a power drill (as seen in the photo below). 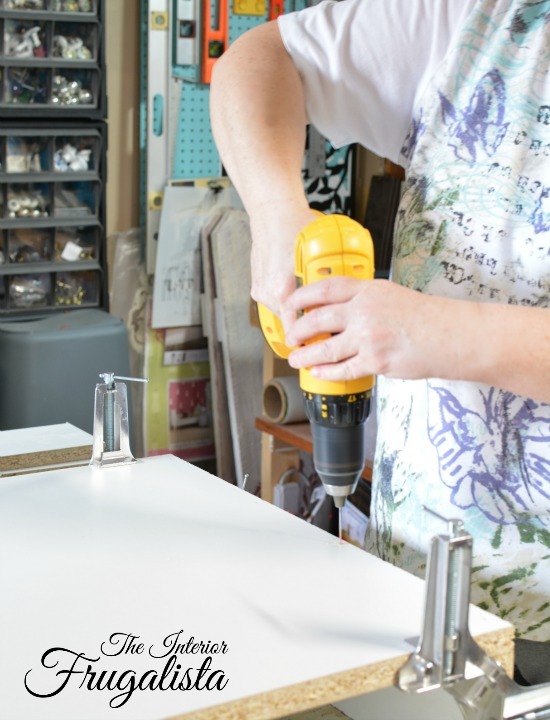 Use a countersink bit on a power drill to countersink the pilot holes you just made. 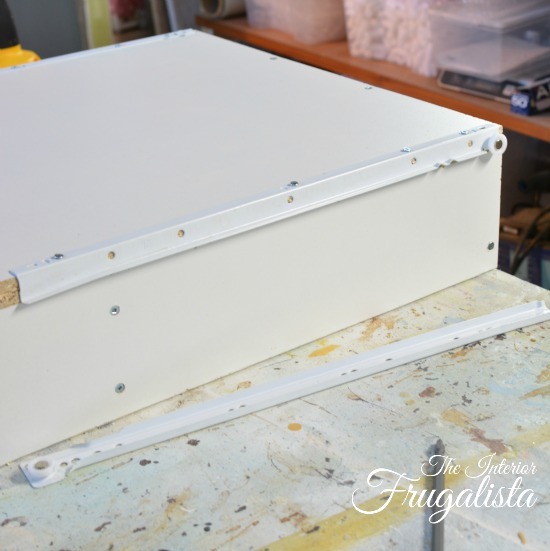 You want the screws to sit below the surface of the frame so not to catch on the vanity base or the slider hardware. 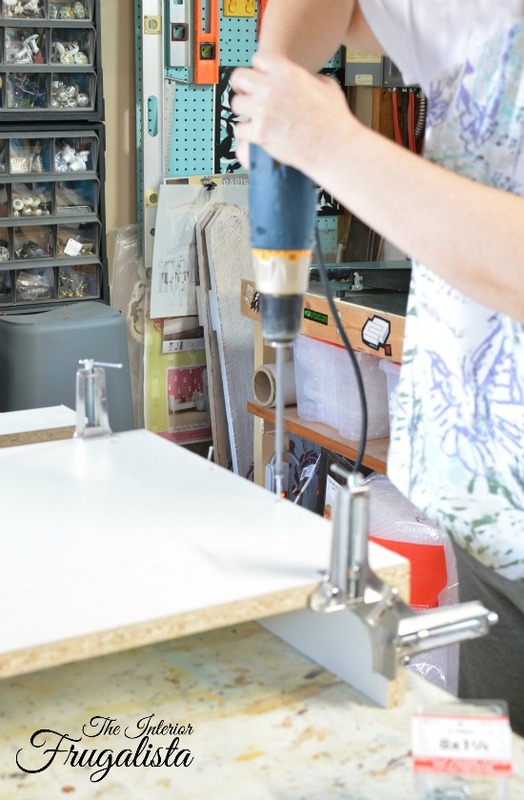 Using a #8 1 1/4-inch particle board screws and a Robertson drill bit, attach the side to the base. Repeat the steps above for the opposite side and both the front and back pieces. Measure the width of the inside of the box. 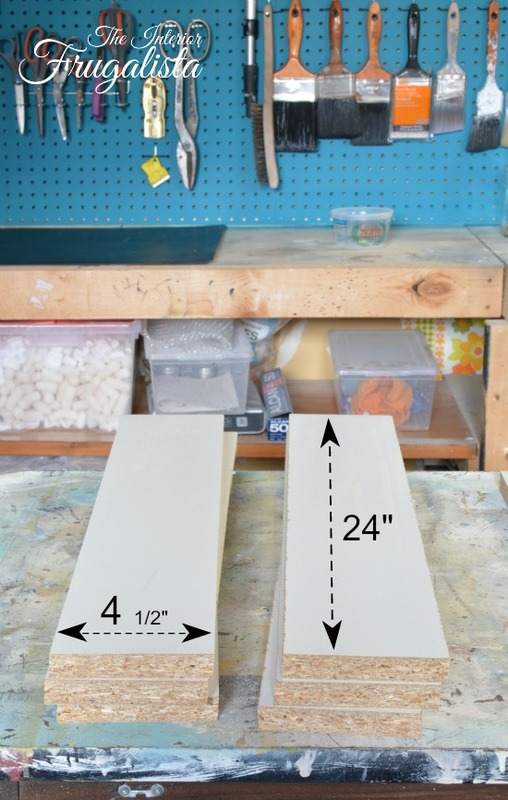 Cut another of your 24-inch melamine pieces to that length (mine is 17 3/4-inches). Divide the board into three and draw a line (my middle cubby is narrower than the other two). Repeat Steps 3-5 on each line (see picture below). Remember those off-cuts I mentioned above, use the two pieces that measure 4-inches. Line them up on the marks you made in the previous step and screw them in place (as in the picture below). NOTE: for now ignore the two screws sticking up (pictured below). Going back to the previous picture, mark the center point of the middle cubby. Repeat Steps 3-5 on the mark you drew and drill the screws in partially (as shown above). 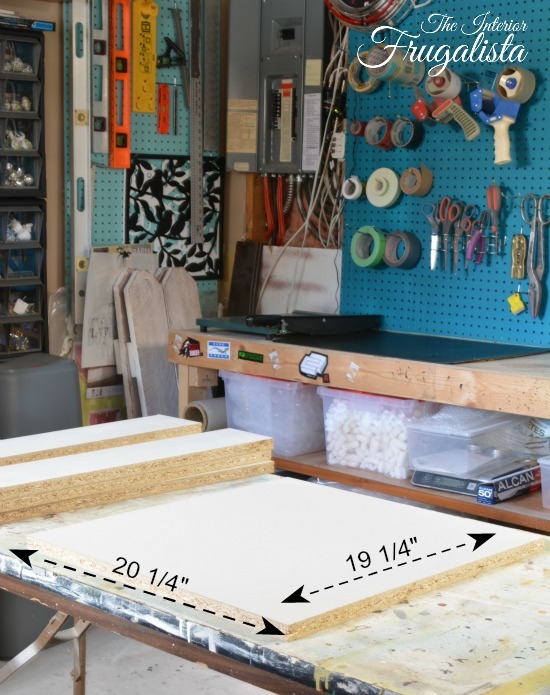 Cut the last piece of 20-inch melamine to 14-inches as this will become the middle divider. 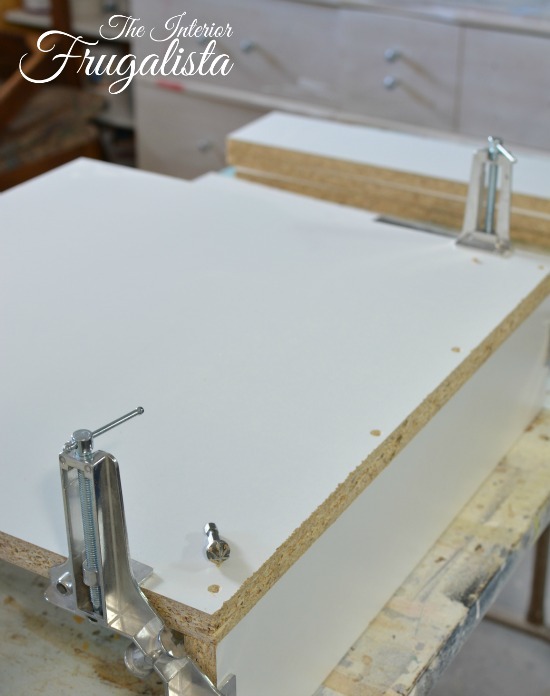 Line up the middle divider with your screws and attach the board. 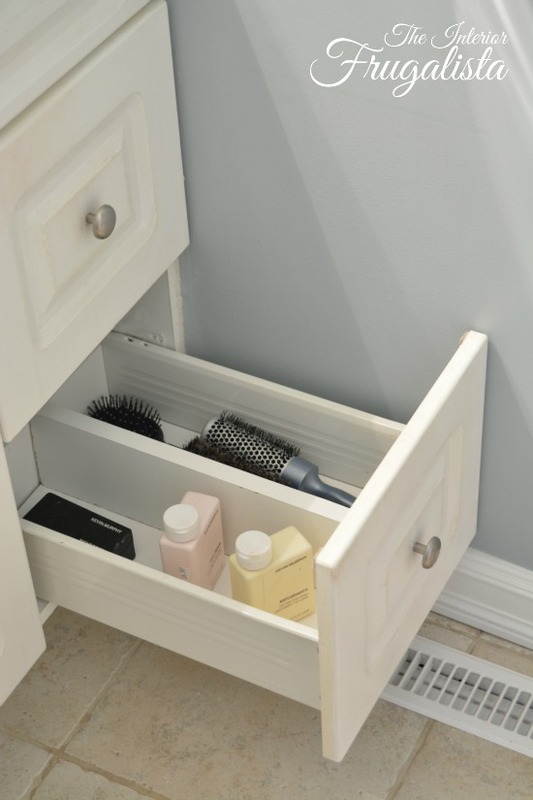 Insert the divider inside the drawer (see photo below). 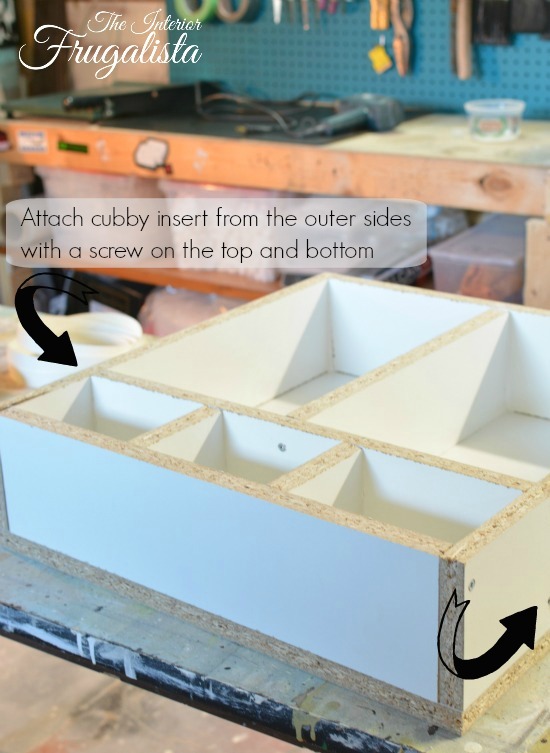 Attach the insert on the outer side of the shelf with a screw on the top and bottom. Remember to follow Steps 3-5 first before screwing it together. Time to hide the ugly particle board edges with White Melamine Pre-glued Veneer Edging. 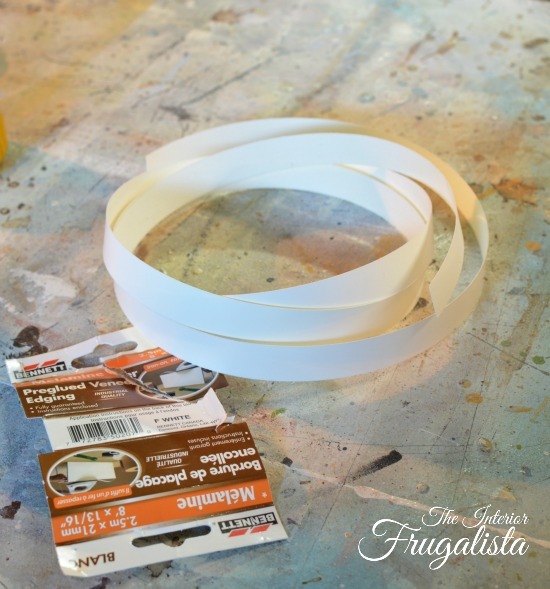 With an X-Acto knife, cut strips of the White Melamine Edging to fit each piece. 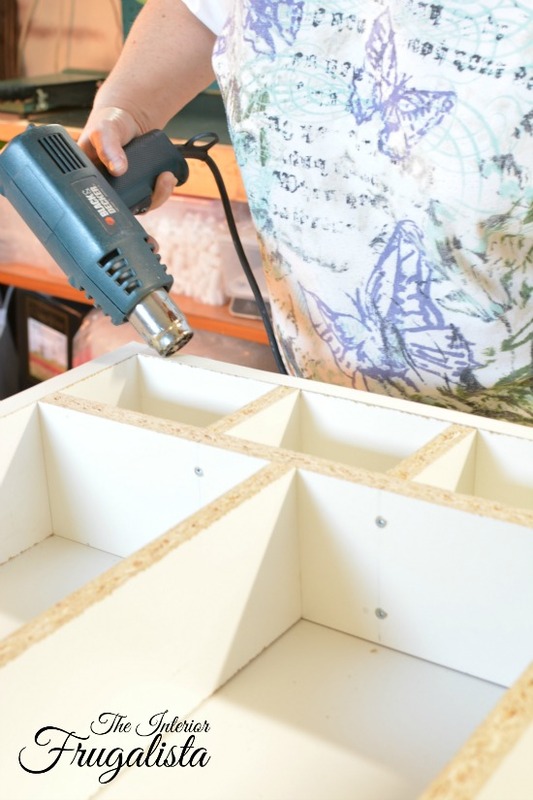 Using a heat gun, adhere the strips to the particle board. Note: after letting the strip cool a little, I used my finger to feel where there may not have been a good contact and repeated the process. 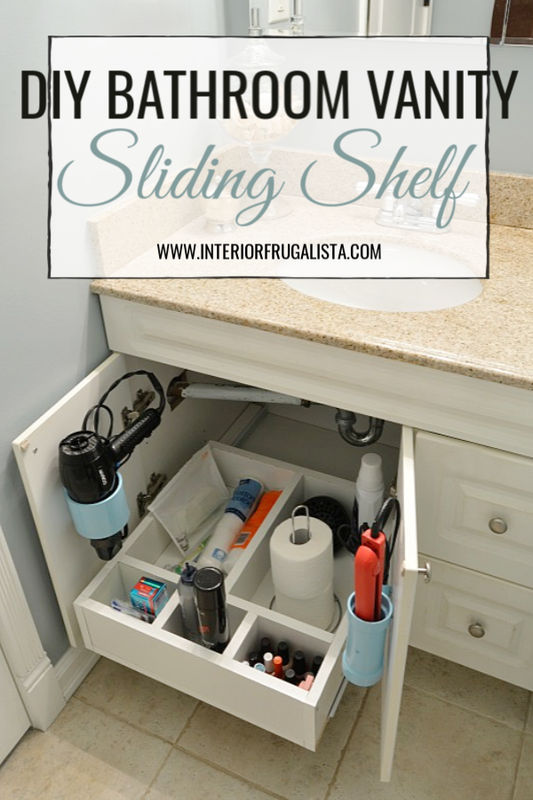 Attach the sliding mechanism of the Side Mount Drawer Slide Hardware onto the bottom of each side of the drawer. Be sure to place them towards the back of the drawer. Using 1-inch wood screws attach them as seen in the picture below. Cut a piece of 2" x 2" lumber to fit both sides of the vanity. These become the spacers for the stationary part of the side mount drawer slides to be mounted onto. They allow the drawer to clear the door hinges (see picture below). 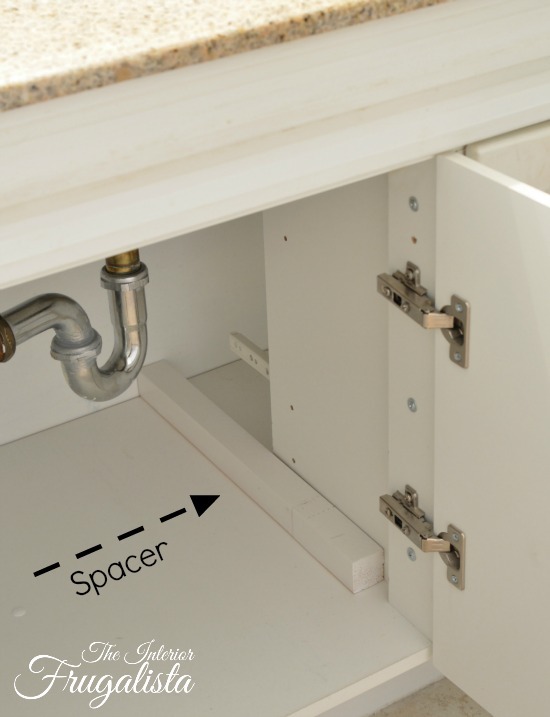 Attach the stationary part of the drawer slide hardware onto the spacer taking extra care that they are mounted perfectly level on each side. 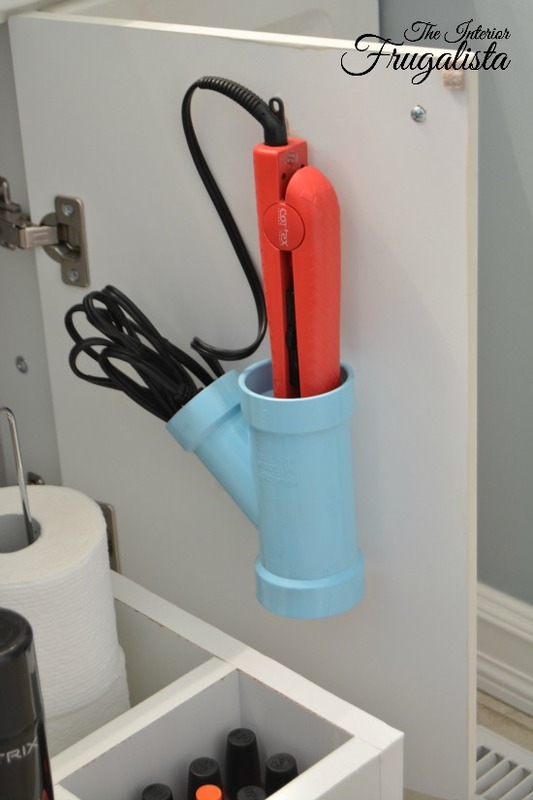 No need to worry about clearing the sink pipes now. Here it is again with the drawer extended. I can't tell you enough how handy sliding shelf has been. 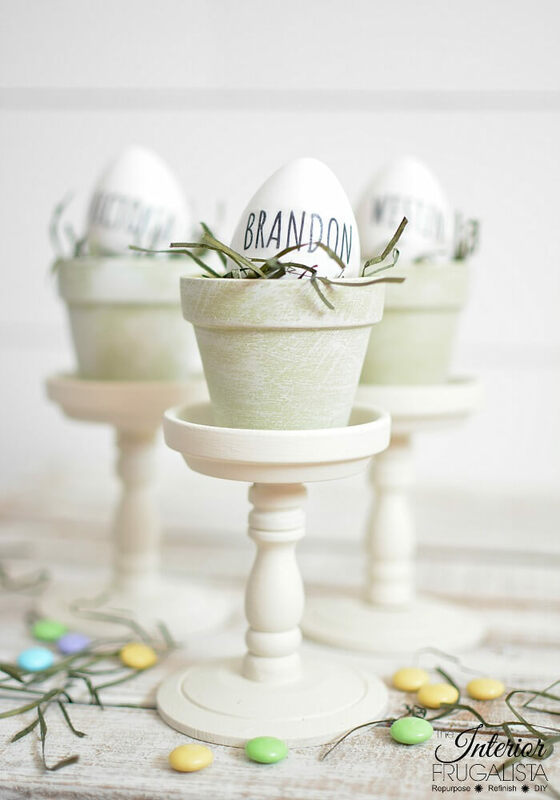 It doesn't have to be just for the bathroom. I plan on building one under the kitchen sink too. 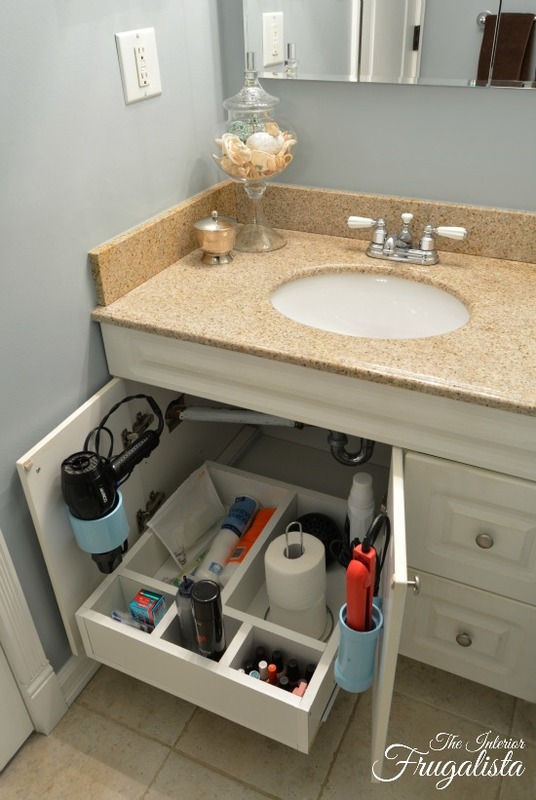 Since I was in building and organizing mode, I made a divider for one the vanity drawers as well and attached it with screws onto the back side of the drawer. 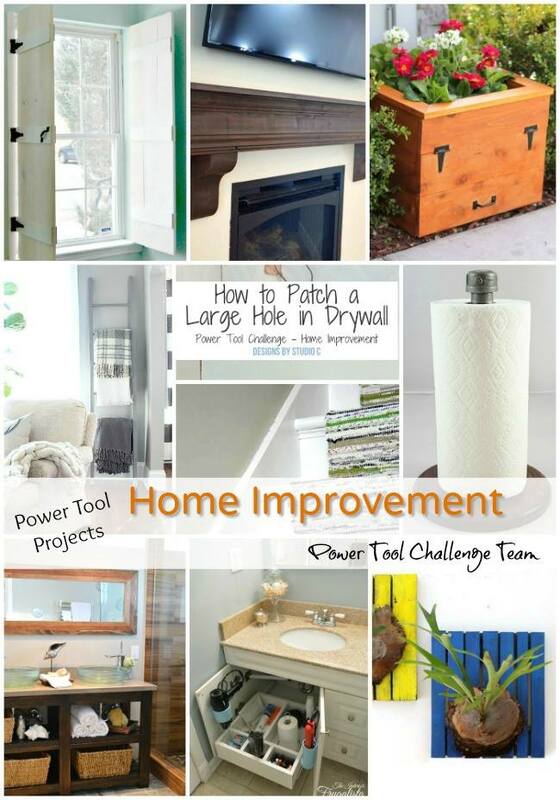 Now it's time to see what my talented friends made for the Home Improvement Power Tool Challenge. 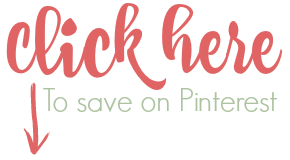 Press the links below to be taken to each blogger's projects.